What is the best head angle for a FWD low racer? I want to be able to race on the road at speeds between 35-60kph. 20" front wheel(driven) and 26" back. I was also thinking about using pistol grip handle bars will this work on a FWD. What sort of wheelbase are you running, and how high is your center of gravity? If it's a high seat, then probably somewhere around 18-20� from vertical. I've had good results from an ~80 degree headtube and zero rake fork for both FWD and RWD. Assuming the 20" wheel is actually a 406mm rim diameter (18" actual diameter) and zero offset (aka rake) an 80� head angle yields trail of about 1.6". This may make steering feel a little light at speed. 2 inches of trail is supposed to give acceptable steering feel for most people. For that, about 1/2" of rearward offset is needed. 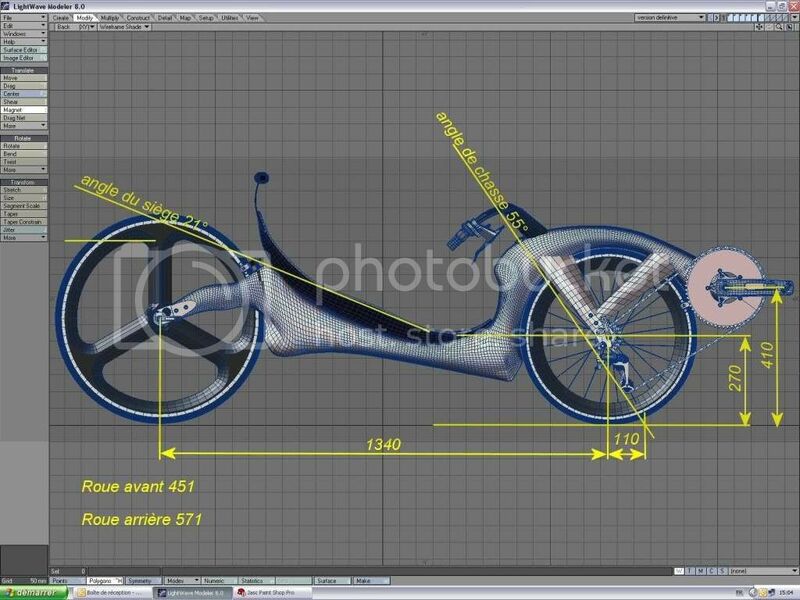 if you're trying to build a bike around existing parts. That bike is what I'd try to emulate. It was very stable at parking lot speeds and did almost 60mph at Battle Mountain. I want it to have a low seat hight. (ei) as low as I can without hitting the derailleur.I'm thinking about 7" from the ground. Yes it is a 406mm rim. I want something like the "rapto" low racer,but lower. I also want to add a fairing to it at a later date. I'd aim for 65-70 degrees for the head tube. Less than 65 causes a lot of fork flop and makes it harder to start. 75-80 degrees makes it incredibly easy to start, but usually a little less stable at speeds above 40 mph. You'll end up optimizing your own handlebar and grip position, maybe trying to tuck your elbows as much as you can up and into your body instead of hanging out or hanging low in the wind. If I was going to build a FWD lowracer again, I'd build one of these. Here is John Morciglio's latest, very cool FWD, swing-arm lowracer. I'm not sure what fork angle he used, but he optimized where his handlebars are attached to minimize torque steer. I got to see this beauty in person. Its a work of art. Also its very light - John measured about 21 lbs before adding the tailbox. What do you guys think of the "Zorkrabikes"
I agree with Larry, for high speed you want more trail. I have been using 3" of trail on my FWD streamliner with a straight fork and that works well (406mm wheel). My FWD lowracer (406 mm wheel) has 2" of trail, and it's a bit darty, so I'd add more trail if I did it again. 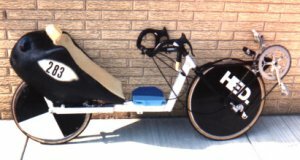 If you have a high BB (relative to the seat, There is a great deal of pedaling torque that effects your ability to steer. I was never satisfied with the handling on my Crash o Matic. It appears that the Python resolves this issue by moving the pivot back. It looks like many people have successfully made these bikes, So that's why I said I would build one. I'm not sure about your specific needs, so it is hard to say if it fits your requirements. 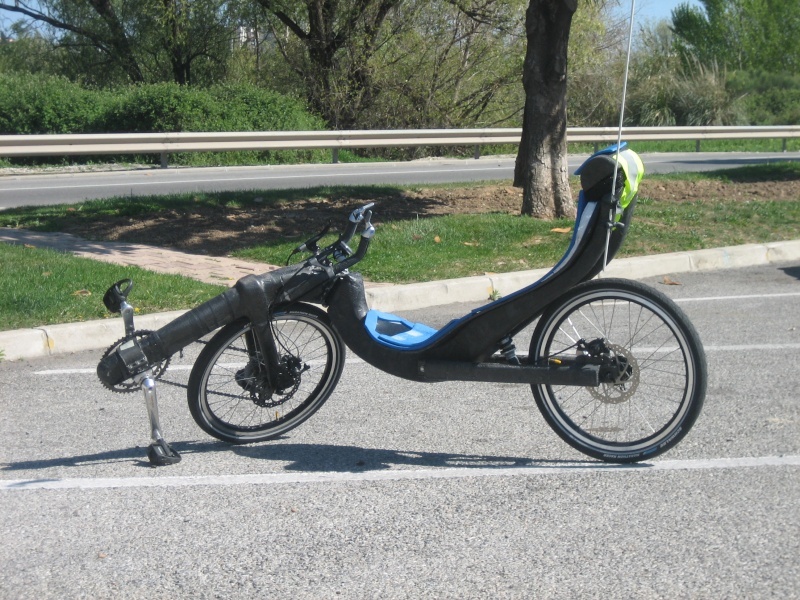 I look at it and see potential to be the fastest recumbent unfaired hour bike. A bike like John Morciglio's is another interesting route to take and by looking at the height of the BB relative to the seat I can tell it would be easy to ride. Reading that the Kouign Amann special only weighs 7.3 kg, 16 lb and seeing the no hands video has me very curious. My own attempt at this as one of my first recumbent experiments failed horribly, so I haven't been interested since then. Is it only seat to bb height that moving bottom bracket bikes to be unaffected by pedal steer? What was obvious to Sean that made him think this? I can see that much personal experimentation will be needed when I get to it this summer. As min bb height is usually set by avoiding heel-to-ground interference during hard turns, that would put the seat at least 13" above ground (not 7"). The World Famous Crash-O-Matic 5000 is for sale. I don't have the Hed disk anymore, but I think I can provide you a nice complete bike for the trade of a new wireless Powertap hub. The bike breaks up nicely for shipping. I think I had the weight down to 11 Kg, but the front end is rock solid. Tandem fork blades were used. If you are interested you can email me at costin@wowway.com. 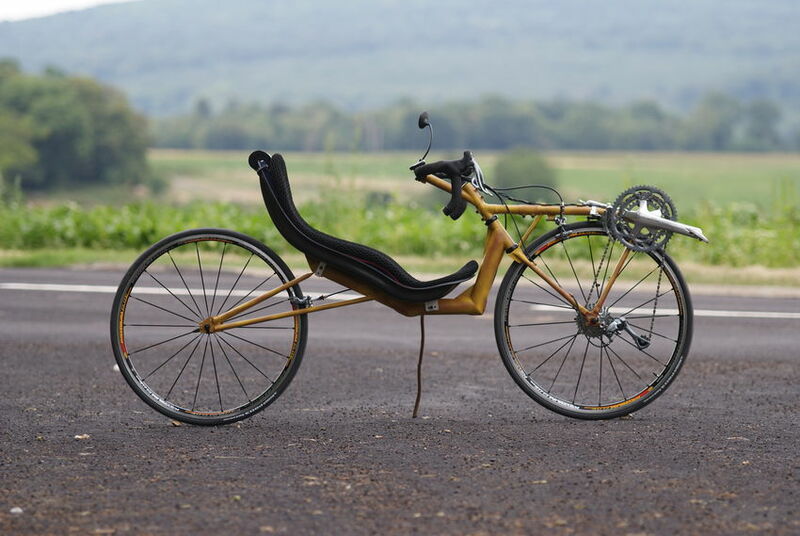 Thanks for the offer but one of my favourite things about recumbents is building them. I just can't make up my mind on what I want. in french but you may use google translation option when opening the link. I immediately used without hands, and I soon realized it was better than Python. In Python, sit on the seat prevents only the "wheel flop", and does not provide stability of the trajectory. The wheel flop is penalizing the direct traction during the learning period: therefore, avoid at all costs. Start position, hands down for balance, and feet on the pedals, start at low speed, and in case of imbalance immediately put 2 feet on the ground before the occurrence Quene wheel flop. Then leave a hand on the ground on each side, feet on the pedals. Once out of the bike path that was set, 2 feet on the ground, and leave etc.etc. At no time, at least initially, the hands do not go for a handlebar assumed wrongly saving. If learning is completed, not a single fall, and growing confidence in the machine. Ca is very fast. Result: faster learning than a Python stability downhill, not whimsical behavior of the beast. 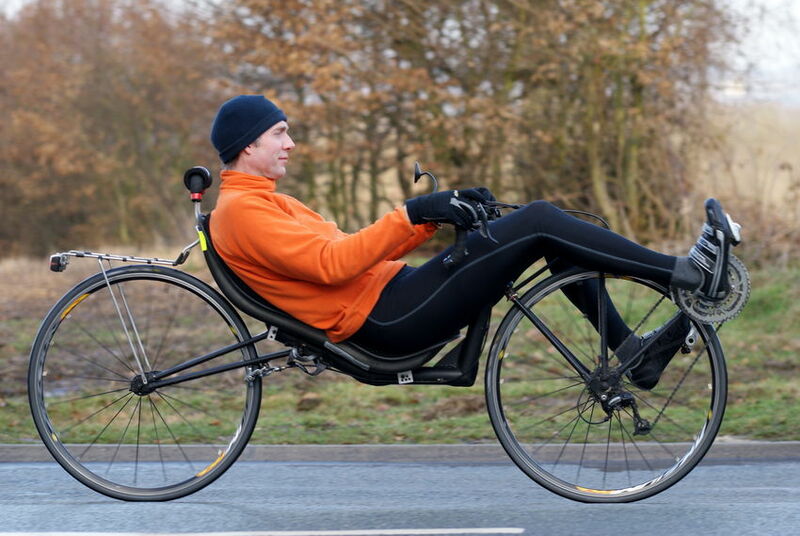 if you want to race search for "speculoos recumbent" and you will find some ones like this one : a real racer "la vip�re noire"
In addition, the views of Marc Lesourd who has wanted to play guinea pig in this story. like the Flevo and Python, Laurent led a bicycle balancing stability, rigidity, simplicity and maneuverability. Without special training, but without a larva be human, he succeeded in good performance riding his prototype. In particular, this was the case during the HPV World Championships in Aalborg (DK) in 2005. At that time I seriously considered changing the frame to replace my Cobrabikes Royal, one traction before "traditional". Rightly considering that I still spend my meager savings on an alien craft, Laurent offered me a deal: he would build me a bike for free on condition that I use in competition to prove the validity of the concept. Originally the contract stipulated that I was to win races, but that provision was quickly abandoned. A few months later, Laurent delivered the bike in person, and after some minor adjustments and procrastination of my own, I made my 1st laps. I must say that I never had the opportunity to test one of the Laurent's bikes before because of my legs too short. Learning was harder than expected. "Thread" the bike proved already acrobatic, but less difficult than being disentangled! The steering seemed very heavy. At the that turning the handlebars too, I had to stop and restart line. Press power on the pedals was only a fantasy for me. But I didn't gave up , and after a few days of practice freewheel, I was on the road. Incidentally, there is a video on the site Johnathan (jnz) showing my 2nd real test inconclusive. I was already able to reach 40 mph and stay within the paved path of 1 m 2 wide ... or less! But climb even what the less Bosselet was still almost impossible. The torque generated by my legs was too powerful to be controlled by my arms. Besides they are my shoulder and arm ached after an outing and certainly not my legs. The next step was to make my commute on 20km of "my" bike path along the Isere. Although through my pedal automatic control of the craft had improved, I still uttered from time to time when a "@$%^&&&!!" deviated from my path way impromptu to the river in low-cons. And then suddenly, some time later, one day mastering the bike was perfect. More zigzags, no more hesitation, just the intense pleasure. And yes, steering was legere and become obedient. I think this aa do with tiny adjustments pedalage that the body is almost instinctively. By analyzing a bit, it seems that I pedal slightly off the axis outwards, ROVISIONS end of pedal stroke (extension). It is why the auto-pedals is necessary to have absolute control of the craft. When I sometimes pedal "dress shoes" I have more difficulty controlling the bike at low speed. The bike is very rigid and the efficiency of transmission is remarkable compared to bicycles wiyh indirect drive. This is also reflected by silence during pedaling: No more pulleys squeak. In Zurich in 2006, I traveled 45km in an hour. Too bad my skills in sprint does not allow me to demonstrate the effectiveness of cycling in the short races. The craft climbs very well, it's best from the rest because my playground is the main Alps. I tested the 18% slowly but certainly no crash. I anticipate to install an advanced aerodynamic back this year . - The grip of the front wheel on wet or dirty and could a problem, although thanks to the center of gravity low on my bike this is not a main issue. shopping trips and sometimes equipped with 1 single wheel trailer. Also IMHO, I proscribe the 406 for reporting an issue. The seat angle returns to 20 � to 25 � adjustable, it can reduce the need for 3-4cm. see how its easy to climb (15% !!) , no hands :and guess why the name is "albatros" ! the more the seat is high and / or the BB is high, which may cause unwanted interaction with steering. "pedal steer" as force "A"=power in put at 90* to head tube ,can be then comepaired to "0" pedal steer on same in-line with head tube[not posible but to get point across],so as your power line =[hip to foot line] comes off of 90* to head tube were it is max. bad,like as exsample 30* off you get 1/3 less pedal steer for same power in put. Dose that help any one with some under standing of just "pedal steer" when pedals are ahead of head tube.? This explans why you get less when lowering the BB. but if BB moves with the fork it is even higher force going into steering from extra arm you added to power input[= less control]and you wast lots of power trying to counter leg power with your arms. Making that very poor design work. We actuly also get some other types of dinamic balance force from pedaling that also is a interplay with steering, from the out of balance from side to side of leg/foot load efecting steering. I designed a way to counter most of that efect back in the 80's that I called "Barlow Spinners"
But that is another story compleatly. Most of these designs I'm seeing are just bad,but we humans can learn to ride nearly anything and after a time can even think we're doing good with a design that should of been junked. But then there's fun of making it work kind of anyway,even though it's not good engineering at all. Apart from the gearing issues what else could be a problem with the 406 wheel? The reason I ask is because I am not very tall and have short legs for my hight ,I don't think I'd have the reach for bigger wheels. Do you have any more pictures or drawing of "speculoos recumbents" I prefer the one's with out the over shoulder frame. Most of the racing that I will be doing will be open road with very few corners and racing against DF riders. Also how are the new handle bars working out? little or no difference between the seat height and pedal height. Staying within these data should lead you to build a bike with a correct behavior. And with the dimensions of the wheels and your legs ones you determine the seat height. Are you saying that moving BB are no good? or could you not ride one?